Welcome! Nice to have you on board. Might we see some of these "sunrise photos" you speak of? I'm working on uploading photos from a bunch of my trips right now. When I get my most recent Big Bend trip done (it's the first one I'm doing), I'll throw the link out here. Some really great shots! Congrats! I've been on two trips so far, but I've had some awesome experiences! The Pine Canyon campsite #4 is awesome. I spent my very first night in BB there. This was at the new location (away from the trailhead). I wished the damn map had been updated because my wife and I thought we were camped right next to the trailhead. Note that the map we were given at HQ (Sept. 2004) showed the campsite AT the trailhead. We begain our hike of Pine Canyon from the campsite, and it's probably almost 1 mile from the trailhead! (i.e. our fabulous Pine Canyon hike was about an extra 2 miles longer than necessary!). Anyway, PC4 has amazing views and provides much peace and isolation from the world. Sunset and sunrise there was awesome because of the long distances you can see and all the mountains that pretty much ring the horizon. Ernst Tinaja #1 is great. It's in close proximity to the trailhead (could be a bad thing during busy times) so you can hike into the canyon directly from the camp. There's a small hill to the west that once climbed, offers awesome views of the Chisos. We had a nice visit here, despite getting a flat tire and then being surprized by a very stealthy park ranger. We were eating dinner after sunset and all of a sudden became aware of a man walking towards us! I nearly choked on my food, which was a good thing becuase it prevented me from screaming like a little girl. But he was friendly and just wanted to check on us and look at our permit. The campsite is right across the road from the trailhead, so it was a little busy because of people who parked there to go hike up to the peak. The campsite reminded me some of PC#4- it's in a very open, flat stretch of country with mountians off in the distance 360?. I go to Big Bend for the scenery mainly, but also for the peace, quiet, and solitude (hey, who doesn't? ) I think that any backcountry site that is remote and tough to get to will be a pretty good site. I'd like to try the campsites at Telephone Canyon, Willow Tank/Ernst Basin, Glenn Spring, Juniper Canyon, and Dominguez Trailhead. 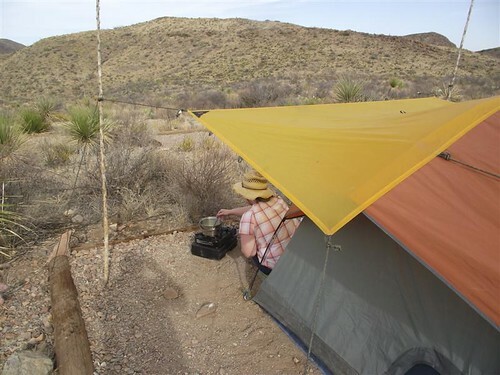 Of course with Zone camping rules, you can camp just about anywhere outside the Chisos! Any backroad campsite is better then, dare I say, any of the grouped campsites . . . Go for it! Re: Best and Worst primitive roadside campsites? If it is OK, I'll breathe a little life into this thread. Are there any of these primitive roadside campsites with anything remotely resembling shade--a small bluff, a single cottonwood tree or anything of the sort. I know it is unlikely but you dont' know if you don't ask. kevin, paint gap 4 is surrounded by hills, it is in the shade early evening. all the others i've seen have no shade, i take some. we've used a popup out there with good results, it didn't blow away! the sun sets earlier at the sites on the east side of the chisos. The last Grapevine Hills site, I think it's 5, is surrounded by brush and if you laid down in the right spot might even have some limited shade at noon. If you want shade, stay out of the desert and opt for the upper Chisos. Yep. That's what I thought. The closest thing I could think of that is automobile accessible is Twisted Shoe. twisted shoe, robbers roost, pine canyon 5 are three of my favorite campsites. robbers roost has two or three tent spaces, it's the largest of the three. 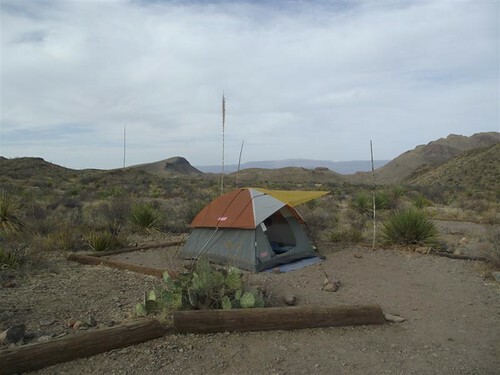 Last April we camped at PC4...there wasn't any shade, but there were two nice sotol stalks at the camp site. I put an awning on the old Coleman using my siltarp and shocked the tie downs over the tent with some small bungees, which worked well in the high wind. It worked nicely as a wind block when cooking dinner and provided enough shade for us to relax and enjoy a cold one from the cooler. 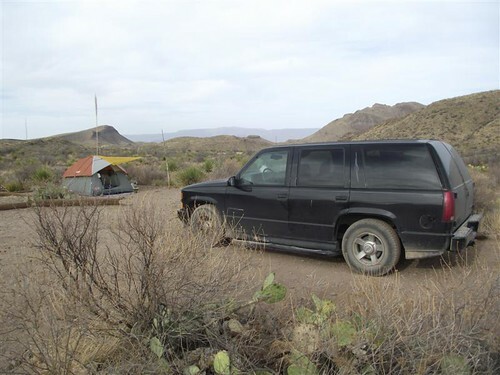 This was our first trip to take advantage of the primitive road sites; we camped at Terlingua Abajo and Grapevine Hills as well. Somehow it felt like we were cheating. It was nice to break out the cots and the big thermarest...why not cadillac-it when car camping?